Today's family is one I have had the pleasure to meet and chat with personally. Joan is a plethora of information and is passionate about sharing her farm story. Thanks Joan for being an inspiration to farm women everywhere! My name is Joan Ruskamp. I’ve been married to my husband, Steve, for 33 years. We live in northeast Nebraska on a farm west of Dodge. Our farm began in the late 1800’s. It was sold to Steve’s great-grandfather on February 27, 1914. At some point the farm was given to Steve’s grandfather, Joseph Ruskamp, possibly as a wedding gift. Joseph and Anna raised 14 children in a house we started our family of five children in. Two of those children, Steve’s uncles, remained on the farm as bachelors. When one uncle died and the other retired the farmhouse was empty. We were approached by Steve’s uncle about living on the farm. Steve knew the farm well growing up as they did many jobs together in the family. The house was in pretty rough shape but we thought it was a beautiful farm with much potential so that is how we ended up living here. We had a saying about the house and barns “The house was built in a day, the barns were built to stay”. Many relatives were impressed with how well we were able to make the house a home. Steve’s grandfather was a cattle feeder, a farmer and an inventor. 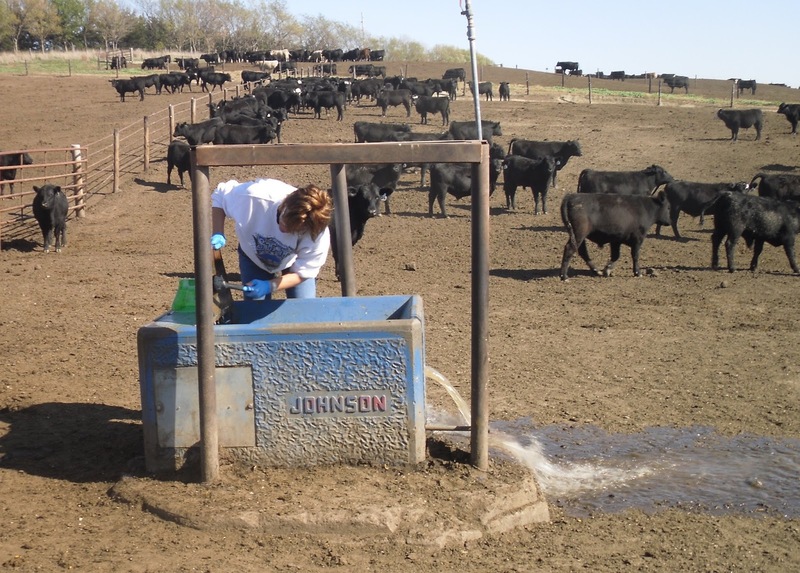 We were able to utilize many features already in place as we started feeding cattle. While the farm looks different today we are pleased to say that the extended family has been pleased with the improvements. 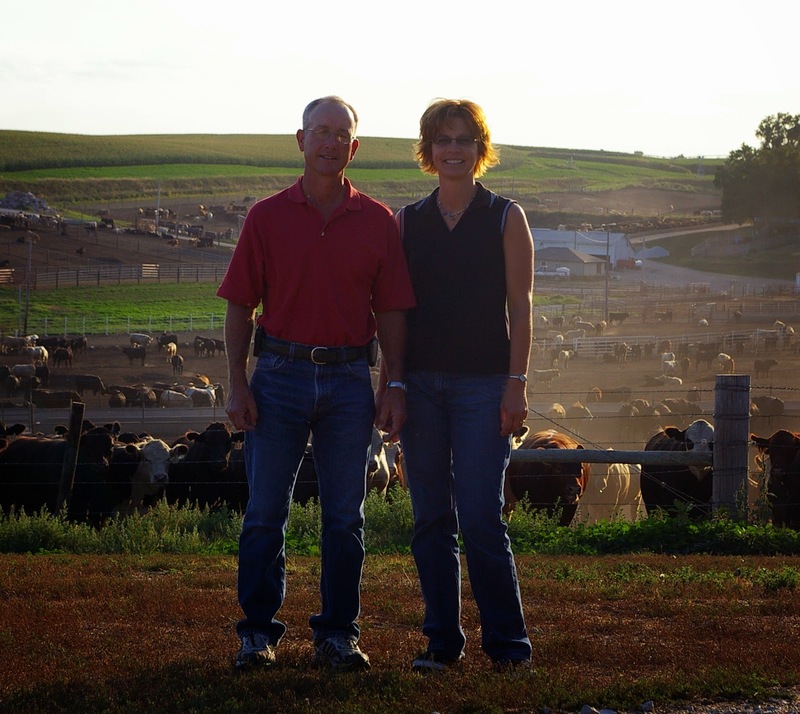 Our farm produces corn, soybeans, alfalfa and cattle. 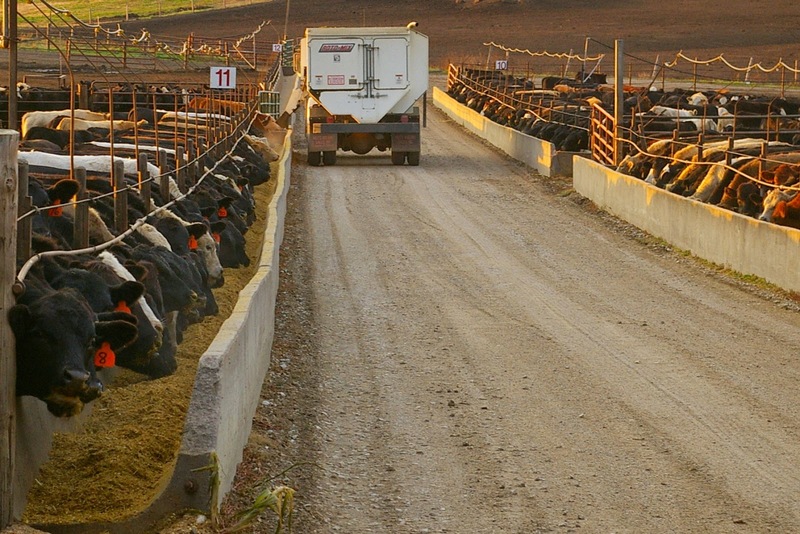 The largest portion of our time is spent with our cattle. We share equipment and time with another farmer for our crops because we don’t have enough land to justify the expense of owning the equipment ourselves. 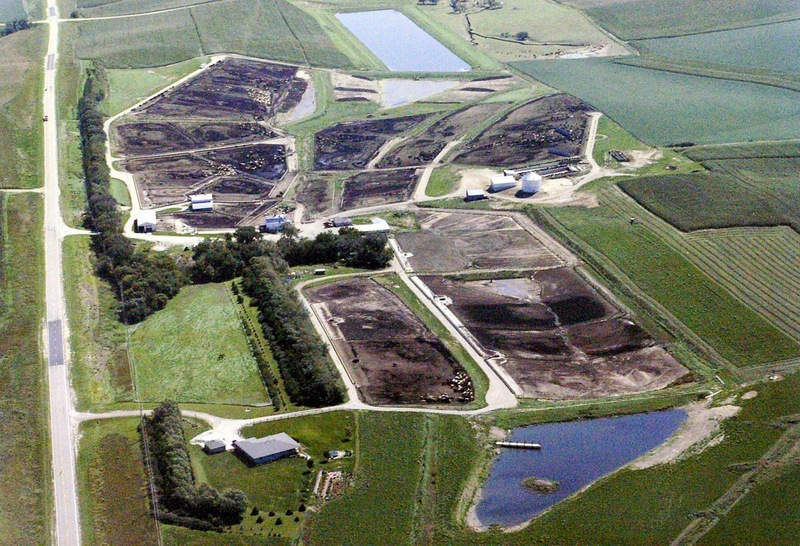 The feedlot started out with a few hundred head in the 1980’s and grew to the current capacity of 4,000 head. 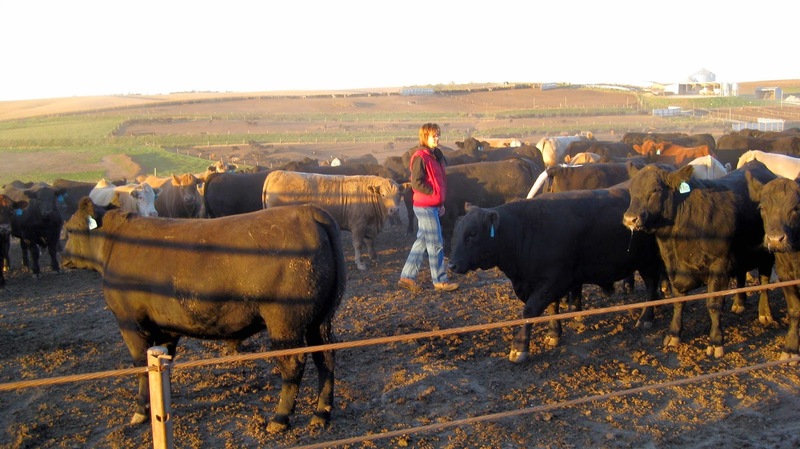 Caring for livestock keeps us busy all year round. The busiest times tend to be during harvest and planting, fall and spring, when we are fitting in the extra jobs related to our crops. We use all of our corn and alfalfa for the cattle and sell our soybeans. In the fall we also receive larger numbers of calves. New cattle take more intensive care for feeding, vaccinating and monitoring for sickness. When our children were growing up they helped in any way they could. We planted hundreds of trees that needed watering and mowing. All five of our children were in the 4-H program and learned how to care for cattle through the bucket calf program. The kids were also very good at answering the phone and giving directions to our farm or taking detailed messages. 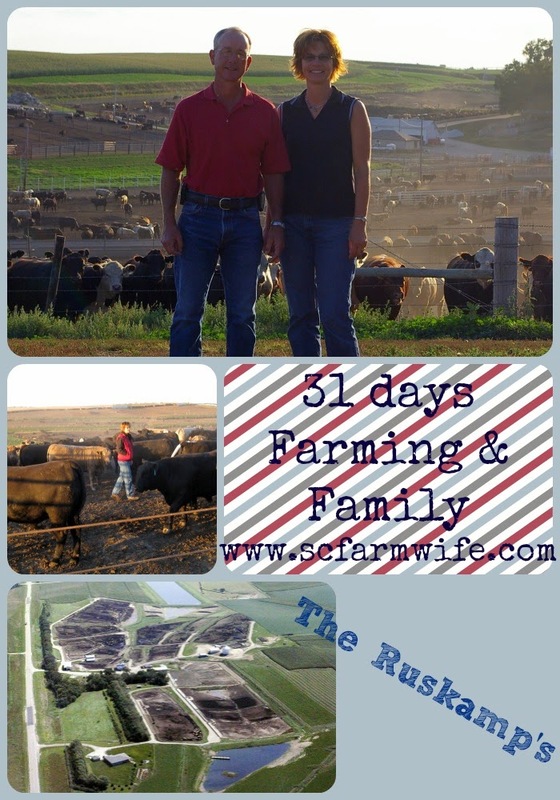 The two boys became the most active on our farm by feeding cattle and helping with crop work. Our five children are all grown now with one still in college. So far we do not have a son or daughter planning to come back to the farm. Our granddaughter loves the cattle and spending time on the farm so we are hopeful and accepting of whatever happens. My full-time job now is the farm. My involvement with care of the cattle increased as the children started school. Many times I did the bookwork late at night when everyone was in bed! I have a love for landscaping so besides the daily routine we have with our feedlot work I also spend time planting flowers, mowing and cleaning to create a place that is enjoyable to look at. My off the farm activities include volunteering as an EMT, 4-H leader, parish catechist and miscellaneous organizational activity. One of my favorite volunteer activities has been my role on a committee for an annual conference for women in agriculture. Many of us on the committee have become great friends through our work together and we get to put together a day to support other women in agriculture. Our activities as a family usually revolve around the weather. In the summer we have been able to spend time fishing and swimming in a pond near our house that was designed just for that purpose. We have an eating area to eat around or just build a bonfire and sit around. That has been a highlight for our family, friends and extended family visitors. A family knows the value of working together for the good of the whole. My father-in-law has been involved in doing odd jobs for us because he wants to help out. On a farm there are all sorts of jobs that aren’t always fun to do but they must be done. With employees we have found a lack of the same spirit of teamwork and willingness to do all that is needed. When our children were working with us they learned the value of long hours, the lack of control we have over weather and finding solutions to problems. While we would love to have any of them working with us we are happy for them in the choices they have made and I believe the skills they learned growing up on a farm greatly influenced their successes. Seek first to understand. I did not grow up on a farm so I learned a lot about what goes on by living it day after day. As a cattle feeder I have heard many concerns that are based on fear instead of fact leading to misunderstandings about how we produce food. I am a mom and I did the best I could to raise strong, healthy, smart, active children. I believe most moms strive to do the same and today there are more sources of information trying to influence what a mom should or shouldn’t do. Find women in agriculture that have something in common with you, like being a mom, and ask questions about how we raise your food. In the United States we are surrounded by plenty of food and plenty of food choices. I would like to keep it that way and it will take continued new technologies to do that. Our farm started with horses pulling the implements, then in the 1930’s this farm had small tractors and electricity. With the increase in technology we are able to produce more food using less land and water while increasing the fertility of the soil for the next crop. Thanks again to Joan for sharing about her family's farm with us! 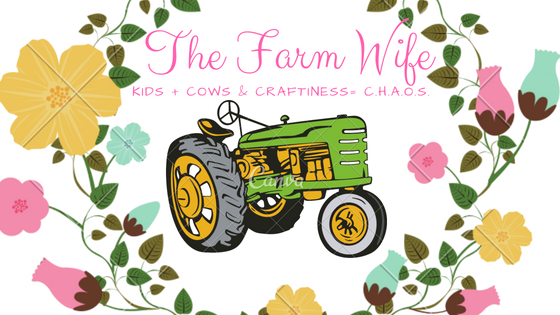 If you would like to know more about her farm please visit the links above or leave questions for Joan in the the comments! Until we meet again...may God bless you and keep you!